Leather Round Dog Collars are traditional working collars that were created for rural pursuits and worn by working dogs and gun dogs to retrieve game, made from premium bridle leather with a consistent grain and thickness, that are sewn for strength and not riveted. The round leather dog collars we sell are tanned with 100% natural fats, that help the collar remain supple and improve quality over time, when cold these fats sometimes migrate to the surface of the round collar and leave a white wax like residue, that can simply be polished away with a soft cloth! All our round leather collars shown on the website have Heavy Gauge Buckles and D Rings for extra strength and long term durability, that are ideal for both working dogs and gun dogs. The round leather collars and sewn choke collars are reinforced with a Nylon Core for added strength and long term shape retention, whilst the premium bridle leather adds strength to the round collar's fixings and enhances the smooth texture of the round collars. 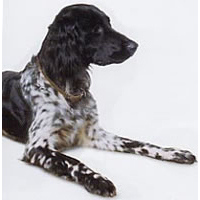 Both round leather collars and sewn choke collars are also suited to long haired dog breeds, as the collar doesn't flatten the coat, consequently round collars are ideal for breeders who show their long haired dogs! Leather is a Natural material which has a number of benefits, it looks wonderful, is strong and water repellant. However if your dog is guilty of constantly chewing or enjoys swimming, it is advisable to purchase a synthetic fibre such as nylon for both your collar and lead, which are also available on this website. 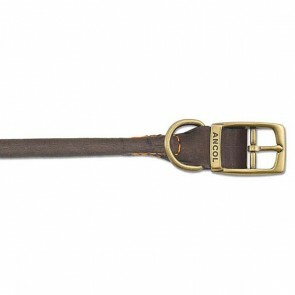 There are many leather collars and leads on the market, but not all of them are made to the same high quality. We stock a large range of Leather Dog Collars and Leads suitable for all breeds, just look at the other pages on this website Studded Leather Dog Collars, Leather Check Chain Dog Collars, Leather & Chain Dog Collars, Leather Dog Collars, Leather and Chain Dog Leads, Greyhound and Whippet Collars. Round Sewn Leather Collars: 5 stars out of 5 based on 3 user reviews.